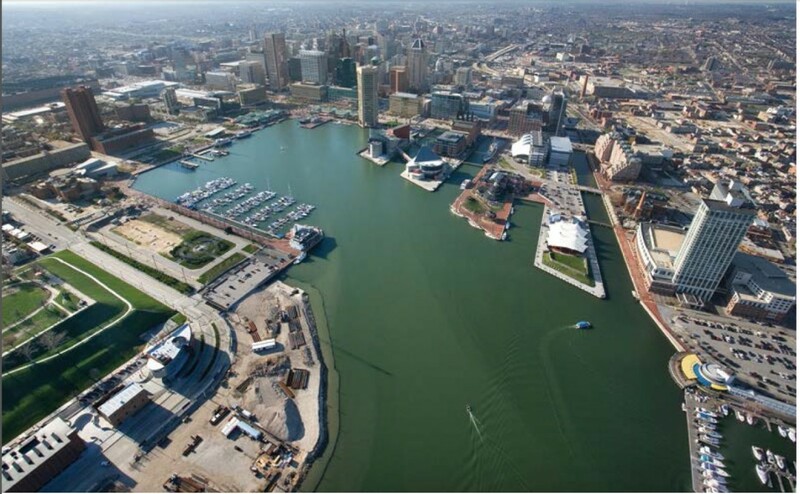 Photo above: Baltimore Inner Harbor from Greater Baltimore Committee brochure. Below, the Inner Harbor and downtown in 1960. The 60th anniversary annual meeting of the Greater Baltimore Committee Monday night was more resolute than joyous, as business leaders promised to focus on rebuilding and restoring a city whose long-simmering boiled into looting and arson covered in national and international media. Those at the dinner reaffirmed their own commitment to Baltimore by pledging over $150,000 in less than two hours via text message during the course of the dinner. That will be matched by $50,000 from GBC and go to a Baltimore Business Recovery Fund to aid businesses damaged in the rioting with limited or no insurance. Ironically, the Greater Baltimore Committee was founded in 1955 when Baltimore had reached the peak of it population at nearly 950,000 people. Population has dropped by a third over the six decades and is now at 623,000. The GBC is associated with helping lead or promote some of the major physical enhancements that have become the image of Baltimore to the world — the Inner Harbor, the National Aquarium, the convention center and the two downtown stadiums. GBC was one of the first and most consistent advocates of building mass transit in Baltimore from the subway to light rail. It is now an ardent proponent of building the east-west Red Line in the city, a prospect applauded several times at Monday’s dinner. “In the wake of Freddie Gray, is there a bigger near term job stimulus program than kicking off the Red Line?” Warnock asked. In the last 15 years, the GBC has turned from capital projects to more of the human capital in Baltimore, especially after the recent protests and violence. “How do we heal?” asked Don Fry, GBC president for the past 15 years. The GBC plans to enlarge an already existing major program called Bridge the Gap, aimed at helping women- and minority-owned businesses, Fray said. He also chairs the Hire One Youth program, to give jobs to teenagers. At the event where she was praised for her handling of the disturbances, Mayor Stephanie Rawlings-Blake suggested this summer it become the “Hire Two” youths program. Warnock urged changes in state law and policy that would make it easier for those charged with crimes and not convicted, or those released from prison to get jobs. Yet Warnock also praised the Baltimore police, which drew applause from the dinner audience, and for State’s Attorney Marilyn Mosby who is prosecuting the police in the death of Freddie Gray.